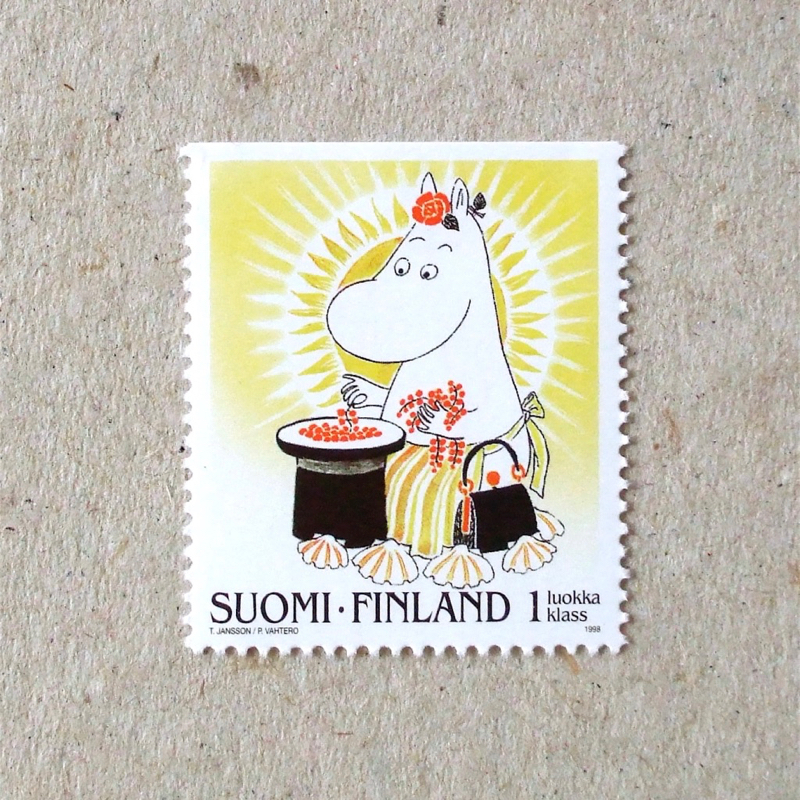 In the last post I featured self-adhesive stamps from 2011, because Nyoro Nyoro was on one of them – but I like conventional gum with perforated edges far better and this is my best favourite set from the Moomin stories. They live in severe Northern weather and the Moomin Troll family is hibernating during the winter. It has snowed all day today here and we are surrounded by a White world. 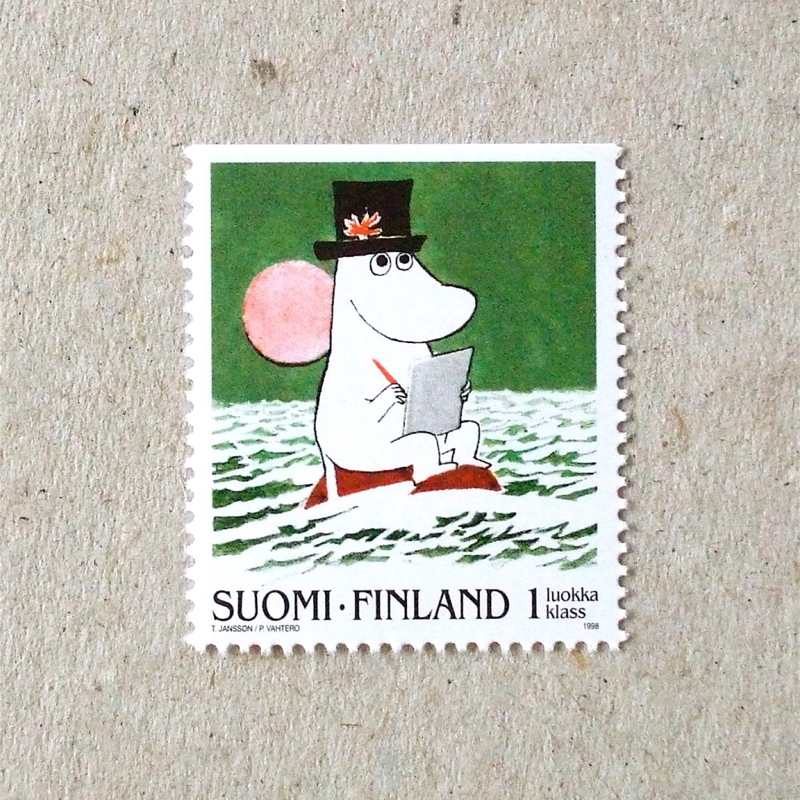 We went for a walk, enjoyed to leave foot steps in powdery 4 inches of snow, but at the same time I am bored by this dull colour of sky and badly dreaming that the warm sunshine arrives soon, and Moomins are coming out from their house. The Tour de France started last Saturday. A young racer from Slovakia, Peter Sagan, has won two stages in the first four days. He was born in 1990, a year after the Velvet Revolution dissolved the Communist country Czechoslovakia to form the Czech Republic and Slovakia. Slovakia joined the EURO zone in 2009. As cycling was popular in Czechoslovakian times, the new-born country has succeeded in this tradition of cycling. This stamp from 1996 is showing their enthusiasm for the sport – pedaling very hard! When the chosen motif and printing method are matching together – the result is good. This stamp with two colour intaglio depicts spiky needles of a Hedgehog very well, as well as the atmosphere of this animal at the bottom of hedges. From my previous post, I think the head beam of a car by Lithography technique works well – density control of blue and yellow – but the Hedgehog is not so well depicted as this example. Can you not see the Queen? Please click the image larger. When the first Penny Black was introduced in 1840, the post office must have sold them a lot and made a fortune – the second printing method they introduced after intaglio, in 1847, was the rather costly technique of embossing. This embossed Machin was made to celebrate those rare ( and now expensive ) achievements of 1847-1854 high value definitives. The die for the press was based on the original Machin cast. Taking photos of this stamp was not easy! Different light creates a diversity of expression in the Queen’s face. One looks more prominent of relief but shows an anxious face, another is paler but with a noble atmosphere. I experienced some of the difficulties of the team who took the photo for the Machin stamps in 1967. This stamp is one of the celebrations of Machin’s stamp, representing the design in the letterpress method. The artwork was made using the scraperboard technique, which was widely used for newspaper, book and magazine illustrations until the 1960s – lines are carved through the black ink coating of the board revealing the white clay surface beneath. Sanderson is one of the few remaining artists using this technique. His reduced and controlled way of using the knife is recreating the Queens face in the Machin’s relief – not at all easy, I would imagine… I first found his works in Gavin Pretor Pinney’s book ‘The Cloudspotter’s Guide‘ – incredible depictions of clouds in black and white. This intaglio engraved by the master Czesław Słania was issued to celebrate The 2000 Stamp Show. After 48 years of his career, Słania’s polished technique to make three dimensional expression by controlled lines are fully exhibited in much larger format, over double the size of the definitive. 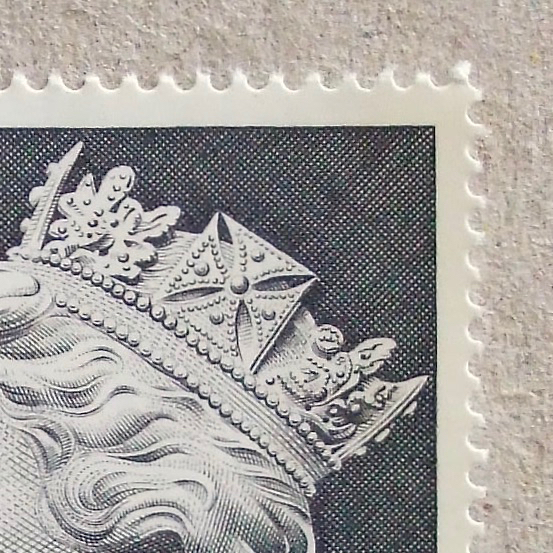 But, somehow this does not look like the Machin original – it does not represent the youth of the Queen, I guess. Perhaps Słania’s precision urged him to reflect the Time and Tide since the relief was made. 66 years ago today, the first Atomic Bomb destroyed the city of Hiroshima and killed about 140 thousand people over the course of several months. My family lived on the edge of the city in the shadow of a little hill and they were lucky to survive, but had to witness a huge number of tragic deaths. p.s. The author of Europa stamps has told me about the designer of this stamp, Hans Erni. He is now 102 years old and is still painting everyday! 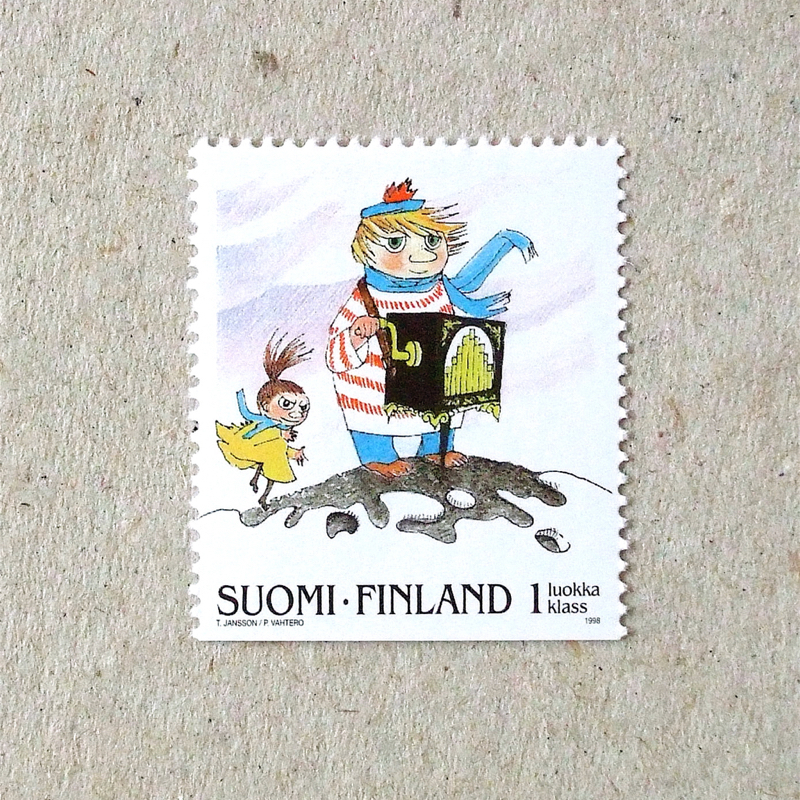 How wonderful it is and his stamp designs. I do love this subtle expression of peace and its sincere atmosphere – his background as an activist tells us about it. The previous two stamps are from a set, completed by these three. They are all on one sheet, as shown below. Bubo bubo, known as the Eurasian Eagle-owl, is a large owl, with a wingspan of up to 2 metres. The smaller one beside it, Tengmalm’s Owl, is similar in appearance to the Tawny Owl, which is hooting near by our house these days, but has a golden ring in its eyes. Maybe the owl I saw last summer in France was this Great Grey Owl, as I saw a kind of white face? But this type of owl lives in Northern areas and is very large – it is also threatened in numbers. 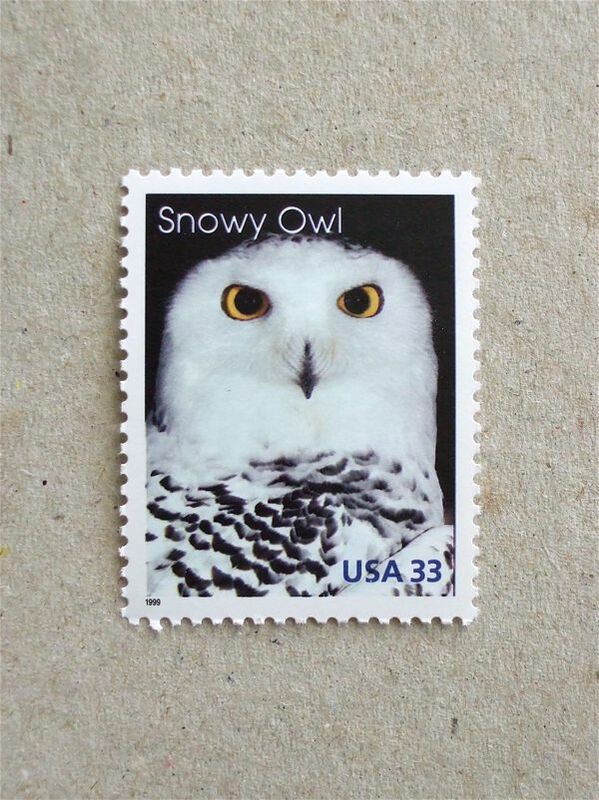 In fact, what I saw was the more common Barn Owl – and its face is featured in this stamp. I was in Köln last week and saw a lots of cyclists like this lady in the centre of the busy town. Separated cycle lanes are placed between car lanes and pavements all over the town and suburban area. You can take your bicycle into trams, as well as trains. With this superb infrastructure, the cyclists are relaxed to move around, less cars and fuel consumption – as a result you become fit, too. Why not those separate lanes in London?? The rest two stamps of previous feature are product for cooking and tableware. Details are all in this Danish web site, Art on Stamps. I did not know that Georg Jensen workshop was funded as early as 1904. Also I did not know that the designer of these famous mixing bowl, Sigvard Oscar Frederik Bernadotte, was Swedish and son of King Gustav VI. Although the bowl looks very democratic, it is named after HM Queen Margrethe Ⅱ of Denmark – ah, they were friends. My first purchase of ‘design chair’ was Arne Jacobsen’s T Chair ( or Baby Chair? similar to Grand Prix chair, but with steel tube with Black plastic covered legs ) from 1955. Then I bought one each of Ant and Seven chairs to follow. T Chair is my best favorite, as posture for dining use is just perfect for me. This set is of stamps are featuring four items from Denmark, which includes my next post. Domestic first class stamp, one of a set of two ( another one was Cockerel ) celebrating Easter. All of a sudden, Daffodils are emerging and blooming over green fields, here in London. I did not know, but Daffodils or Narcissus are toxic if you eat them. Be careful and have a Happy Easter! This morning we had powdery snow flakes on trees, front garden and pavement – and blue sky above all. Shiny sun was up, drew a low arch, and even at sunset the light was clear. Beautiful winter day. I wish you all a Happy New Year 2010! I heard an owl hoot right now, what a nice coincidence! I was thinking of owls in wood, uploading this post. 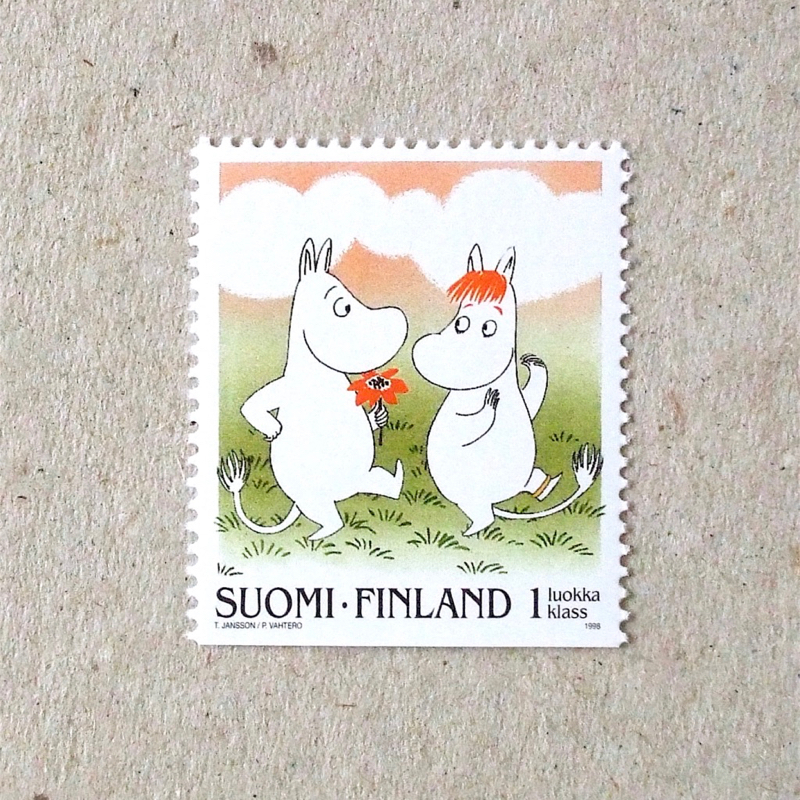 Also, I think these stamps represent feeling of new year’s day, as animals are waiting for spring as we do. This year in Chinese Zodiac is Tiger. I only have one stamp of a tiger, from Korea, which I featured already. This stamp was used by a friend of mine from Germany and I enjoy this appendix picture on the rim of a sheet. It is celebrating a Christian mystic Hildegard von Bingen, who lived form 1098 t0 1179. The picture seems a tapestry and it depicts a garden, as she was known as herbalist, as well as author and composer – one of her music is on YouTube: from album ‘A Feather On the Breath of God’. A few friends of mine from Germany share similar taste about stamps – they often leave the frame of a sheet uncut from the stamp. I do enjoy this bonus illustration and started to look for Christmas cards from Germany. I think this is from ‘Explorers on the Moon’, one of the series of ‘The Adventures of Tintin’ by the great comic writer and artist. I ofetn think about Cuteness or simply what appeal to me – this case, it is clearly Snowy, the dog… in a space suit with tail location.